Maternity care in NSW -What is important to you? We want to hear from as many women and their partners as possible. The survey will close on: Friday 9 November 2018​​​​​​​. 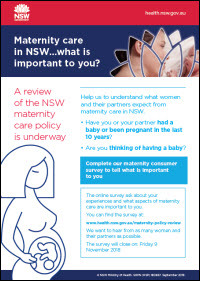 File Link: Maternity care in NSW - what is important to you?